It was the Tom "Mongoose" McEwen and Don "The Snake" Prudhomme Hot Wheels cars, followed by the Revell Models that captured the attention of Capitol Auto Group Racing driver, Rich Bailey, at the young age of 10 years old. Rich would head to the magazine aisle when his mom would do her shopping, looking through the Hot Rod and Car Craft magazines, taken in by the look of the cars and the showbiz part of drag racing. After talking his dad into taking him to Portland International Raceway, Rich's passion for racing grew from hanging out in the pits, seeing "The Snake" and Ed "The Ace" McCulloch up close, working on their cars. It was a race in 1975 at Woodburn Drag Strip, where Rich met Twig Ziegler and his crew. From that moment on, all he was interested in were funny cars and dragsters. There was no turning back. Rich credits his dad for making it possible for him to attend races before he could drive and it was his dad's old GMC pickup that Rich first raced at the Oldies But Goodies Races. It was after his dad passed away that Rich bought a front engine dragster, with the cooperation and understanding from his wife, Susan. 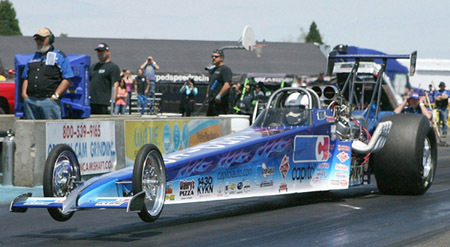 The front engine dragster eventually ran at 170 MPH, but after Rich outgrew it, he went with a different dragster. Following a crash in Seattle where he hit the wall at 140 MPH, the team needed to get a new car quick and that's when the Rocketeer was purchased. Although there were other dragsters in between then and now, Rich currently races the Rocketeer. The Rocketeer was built in honor of Raymond Dixon, a young junior dragster racer from Arizona, who died of cancer. There are all types of space age features, including the back of the car, which is enclosed. Rich and his crew start out with a full schedule at the beginning of the racing season and make adjustments depending on the unexpected expenses that may occur during the year. The majority of races taking place at their home track, the Woodburn Dragstrip, plus Yakima, Spokane and Bremerton. Crew chief, Rick Klampe, lives in Bend and drives over to the valley for the races. Rich describes Rick as a committed member of the team who he's blessed to have, managing the mechanical side of racing. Assisting Rick is Richard Lytle, a dedicated member of the team as well. David Cookman, a major gearhead and Chaplain for Racers For Christ also works on the car, and Adam Bradford, a high school student, rounds out the team in an apprentice role. 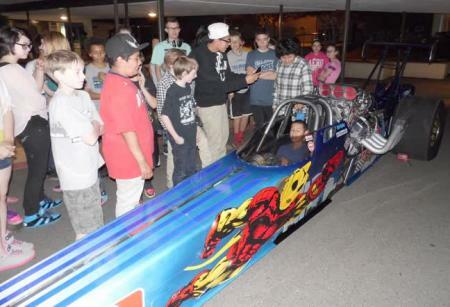 When they aren't racing, Rich likes to take the dragster out into the community and allow others to enjoy seeing it up close, the way he once did growing up. He knows the "hands on marketing" allows for a wider range of people to see the car, rather from in the stands. 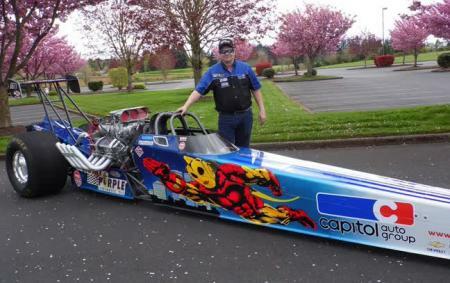 Title Sponsor, Capitol Auto Group, understands the importance of community involvement, and Rich loves seeing the smiles on the kids and adults faces, as he shares his story of drag racing in the Northwest. In addition to the numerous community events where the dragster is on display, Rich and his friend, Jim Billings, promote two car shows each year that raise funds for the Children's Cancer Association. 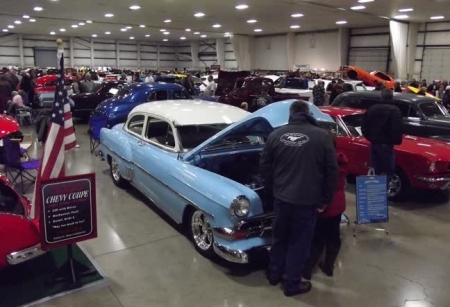 The Winter Rod and Speed Show is held in early January in Albany, Oregon and the Night of Fire, being held this year on August 2nd in Salem, Oregon. The shows provide a great opportunity for the community to enjoy a variety of dragsters, classics and hot rods. It's always a good time for the entire family! Rich's wife, Susan, and both daughters also participate in the shows. With Susan and the girls having other interests, Rich won't have to worry about giving up his seat behind the wheel of the dragster, but it's clear they support his love of the sport. 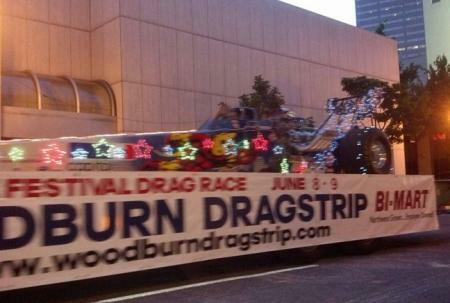 On June 1st, the "Rocketeer" dragster participated in the Portland's Starlight Parade as part of the Woodburn Dragstrip float. 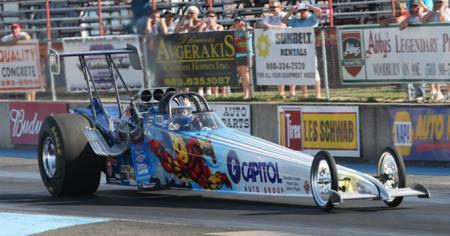 Rich extends his thanks to the Woodburn Dragstrip, Sunbelt Rentals and of course, his crew, for making it all possible. It was a long day, but the exposure was incredible and they took home an award for Best Small Local Business. 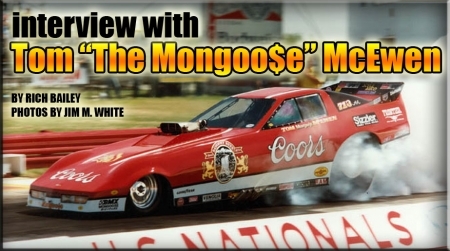 A recent highlight for Rich was an interview he did for his web site with drag racing legend, Tom "Mongoose" McEwen, as racing fans await the release of Snake & Mongoose, the Movie, scheduled to be out on September 6th, 2013. The movie tells the story of one of the greatest rivalries in sports history, and of the groundbreaking accomplishments of Don "the Snake" Prudhomme and Tom "the Mongoose" McEwen in the world of entertainment sports marketing and sponsorship. 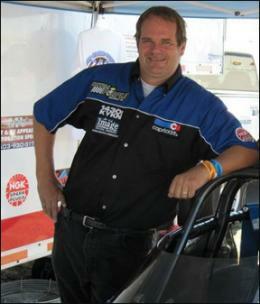 You can read Rich's "Mongoose" interview on the Capitol Auto Group Racing website. Rich would like to acknowledge and thank his sponsors, Capitol Auto Group, Royal Purple, King Bearings, NGK Spark Plugs, Walery's Pizza, Supervinyl Signs and Banners, Competition Printing, Jeff Lewis Custom Paint, MV Detail, Odyssey Battery, Adam's Rib, Image Action Wear, Canby Transmission and Salem Geeks. After talking with Rich to gather information for this article, I've learned that whether it's going down the dragstrip at nearly 200 MPH, or interviewing one of his childhood heroes, I'd say Rich has had the ride of his life! Race safe and enjoy, Rich! It's easy to share this slideshow/article on Facebook, Twitter, LinkedIn and more, using the buttons below ! car shows, cruise-ins, swap meets and classic vehicles for sale. classic vehicles for sale and car events.